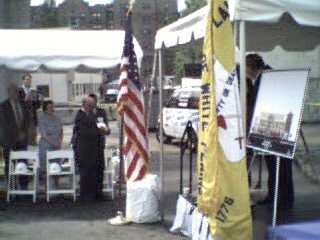 There are several photos online of the mayor of the City of White Plains, Westchester County, NY standing near the city flag. See www.whiteplainscnr.com/old/images/photos/articles/fp-071701/Jul18-01.jpg and www.cityofwhiteplains.com/news/releases/CrimeStats.htm for example. The flag is yellow, with lettering saying "White Plains" "1776" and "New York" and an emblem based on the city seal, which shows a flag bearing a sword crossed with a staff surmounted with a Phrygian Cap. This is obviously based on the Revolutionary War "White Plains Flag". The seal can be seen at www.cityofwhiteplains.com/EnglishWeb.htm.